Be Smart Kids Boxing Gloves Made Of Premium Rex Leather along with excellent glove construction provides long lasting durability and functionality. Full wrist wrap strap provides superior wrist support/ protection and allows for a more customizable fit and reduce the risk of injury to wrist. Be Smart Kids Boxing Gloves Conforms to the natural shaped of the fist for maximum comfort. Heavy duty shock absorption to take the most grueling hits. Suitable for Boxing, Training, Bag work or Sparring. 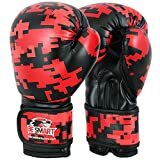 Be Smart Boxing Gloves Sparring Gloves Training Gloves Fight Gloves Bag Mitts Gym Kick Pads MMA Mitts Muay Thai Training Punch BeSmart Kids Boxing Gloves Junior Mitts 6oz Punch Bag Children MMA Youth Think Smart, Play Smart, Be Smart. Try it for yourself and if it does not meet your expectations then we are happy to exchange or refund. Be Smart Kids Boxing gloves made from Best highest quality Rex leather. These gloves have been manufactured using the best quality material and will beat any other similar products available in the market, available at an unbeatable price. Description: Be Smart Kids Boxing Gloves Made Of Premium Rex Leather along with excellent glove construction provides long lasting durability and functionality. Full wrist wrap strap provides superior wrist support/ protection and allows for a more customizable fit and reduce the risk of injury to wrist. Attached thumb for protection and security. Be Smart Kids Boxing Gloves Conforms to the natural shaped of the fist for maximum comfort. Heavy duty shock absorption to take the most grueling hits. Suitable for Boxing, Training, Bag work or Sparring. Kindly visit our store for more items.